Making the rounds for a few years now has been the news that robots are coming for our jobs. Many of us have nothing to fear despite automation increasingly taking over our lives, unless you’re a wedding photographer, maybe? 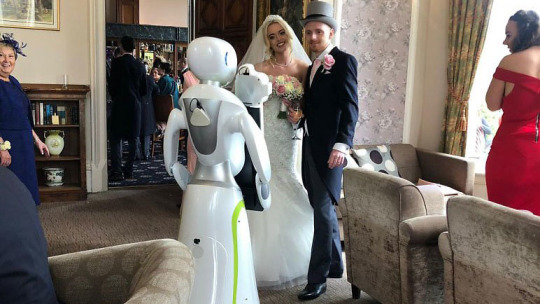 A photographer robot called Eva is the latest innovation in droids for hire or purchase by UK-based company Service Robots. Before asking them if they would like to have their picture taken the humanoid robot uses facial recognition technology to identify people. To capture memories from their big day, Gary and Megan Barker hired Eva to officially shoot her first wedding on April 7 after being officially launched earlier in 2019. In front of her humanoid body Eva is equipped with an interactive colour screen. Before Eva goes click-happy guests can choose from a variety of photography options. So that images can be printed out instantly, Service Robots set up a printing station at the venue when Eva is hired. Provided that an internet connection is available at the venue the images can be uploaded to a social media platform of the guest’s choice should they prefer not to take a hardcopy keepsake home. So, it seems that droids like Eva are more for the novelty of the occasion as opposed to giving flesh-and-blood professional photographers competition for the meantime. After all, she is essentially a fun version of a photo booth or selfie station, one that can easily upstage the couple on their very special day! Words by Elijah (Content Marketer) via Tech Radar. This entry was posted in Culture, General interest, Photography, Recent Posts, The Business of Photography and tagged automation, novelty, photography, robot. Bookmark the permalink.